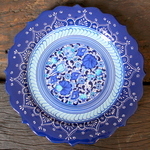 Handmade and hand painted ceramic hanging plates. Its design features traditional 15th and 16th Century Ottoman designs with a mixture of flat and raised painting techniques with ornate edges. There is a pre-drilled hole at the back for easy hanging. Price is for one plate. - Please notify us of which design you would like to receive, you will recieve the exact one pictured. Please note that these are original handmade pieces and as such there may be small irregularities that distinguish this piece from machine made counterparts.